No one ever thinks about the cool breeze coming from the vent although this happens constantly in our world today. In your house, in your office and, for our discussion today, in your car. But there is more to it than just that. Air conditioning, as we call it, also includes heating the air when it is cold and re-humidifying or dehumidifying as needed. Air conditioning is the process of making the air suit our needs. And while this was a luxury until very recently, it is essential to most places we visit or be in today. What are our needs? Human beings tend to prefer around 25°C and a relative humidity of around 40 per cent. Whether asleep or at work, the choice of temperature and humidity is about operating at maximum efficiency. The range that is most ideal for our body's respiration and perspiration rate. The importance of these two rates cannot be overstated. It is said, for example, that human beings do not drown in water and die. Once submerged, the realisation that you cannot breath anymore trips your brain and collapses your windpipe. Back to air conditioning then. Relative humidity or RH is the ratio of moisture (water) in the air versus the maximum amount it can carry at that temperature and pressure. A low RH is about 20 to 30 per cent and it increases our respiratory rate because the are can take more moisture from our body. This dries up the tongue and our sense of thirst increases. This is common in dry, hot environments as well as at high altitudes. A high RH - 60 to 80 per cent - reduces our perspiration rate and makes us uncomfortable. This is usually in cold and confined places, and this is why sometimes we sweat in the cold too. This is the reason why most closed environments with centralised air conditioning like malls, airports and hospitals control both temperature and relative humidity. The systems are designed to ensure that at full capacity people remain comfortable. We will go into the details of the mechanism next month. Smaller air-conditioning units like the ones at home and in cars, however, do not offer humidity control. The small space and the small number of people using the system means the RH balances itself out. So how come air conditioning was something we did not even talk about a decade or two ago and now we can barely function without it? The answer is that we gather in the same place in ever larger numbers today as a matter of routine. Our malls, offices, hospitals and airports have all become places where thousands and thousands of people gather. The heating up of the earth adds to the need for air conditioning too. As humans become more accepting of confined spaces, their need to be in a temperature and humidity controlled environment also grows. In cars, the need is not obvious. We believe we are in cars for short periods and that should not require air conditioning. But the truth is that we spend more time in cars than we realise. And sitting in still warm air, say in a traffic jam, would be annoying. You would arrive sweaty and irritated. Also a long drive with the windows down makes you feel more exhausted than with air conditioning. This is actually documented, not just a feeling. 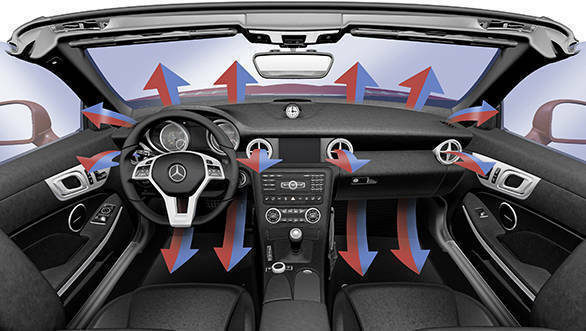 Studies have shown that air conditioning keeps the driver fatigue free for hours which is good for driving as well as for covering ground safely. This is the reason why all of the long-haul trucks increasingly have standard air conditioning. In a weird way, this also seals the argument that bikers are more passionate because they seem to be able to function without help from these systems. Next month, we will talk about how air conditioning actually works.